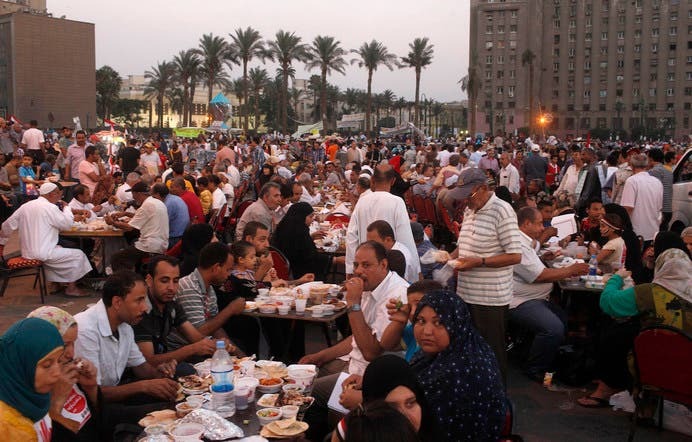 Thousands of Egyptians gathered for a fast-breaking meal that brought Muslims and Christians together in Tahrir Square on Friday, celebrating the first Friday of the Muslim holy month of Ramadan. Tahrir square has been the focal point for opponents of ousted President Mohammed Mursi, who was toppled on July 3 by the army following mass protests against him. It was also the cradle of the uprising that overthrew President Hosni Mubarak in 2011. The unity meal came on the same day that Islamist supporters of Mursi mobilized across Egypt, holding large demonstrations in public squares in several cities. Muslims fast from dawn until sundown during Ramadan, with families traditionally breaking their fast together with the ‘iftar’ meal. Several thousand people came to Tahrir square tonight, in a show of sectarian unity and also to show their support for the toppling of Mursi. Christian Fareg Girgis Abdul-Masih said that he wished all of his countrymen well. “I wish them [fellow countrymen] good health for a thousand years, and may they be well every year. And we are brothers [uses the name for the Muslim Brotherhood], and may God continue to give us peace , and may we be brothers, not like the Muslim Brotherhood, no, truly brothers - Muslims, Christians, all of us united,” he said. Across Cairo, tens of thousands of supporters of Mursi also demonstrated, demanding the Islamist president’s reinstatement. Mursi was removed after only one year in office, and his supporters have said he was toppled by a military coup that threatens to undo Egypt’s unsteady transition to democracy. But Ashraf Hasan Ali said the mass protests that took place on June 30th against Mursi were the beginning of Egypt’s rebirth following the president’s failed rule. “Today, after June 30, we have regained everything. And thank God, Egypt has returned ten times stronger than it was before,” he said. Mursi’s critics say that while he was democratically elected, he ruled in an anti-democratic way that threatened to further divide a country already mired in political turmoil and an economic crisis. The Imam who gave the Friday sermon in the square said that today’s iftar was intended to bring the country together after a long period of divisiveness. “This iftar [fast breaking meal] is a national unity meal, in order for us to say that Egyptians, Muslims and Christians, make up one square and one nation. And this is an iftar to honor the blood of the martyrs and we are demanding justice for them on this Friday, so this is an iftar for the souls of the martyrs and for national unity,” said Mohamed Abdullah Nasser. While many are calling for unity in the wake of Mursi’s fall, tensions have risen following the killing of 53 of his supporters by the army on July 8 at a protest outside of an army barracks where the President was reportedly being held. Several policemen and a soldier also died in the clashes.